G&A roof repairs are professional and recognized roofing contractors in Croydon with over 25 years experience. We operate throughout the UK and carry out emergency roof repairs, full repairs on domestic, commercial and industrial properties. Our clients range from the home owner to British Gas, Home Assistance UK, Local authorities, Insurance companies and many more. We are members of the Confederation Of Roofing Contractors and. All our works are carried out to the highest possible standard and all new work comes with a written guarantee. WHAT OTHER SERVICES DO G&A ROOFING CROYDON OFFER? We cover fascias, soffits, guttering, chimney rebuilding and repairs, lead work, valleys, box gutters, flashings, commercial and industrial works, sheeting, cladding, roof de-mossing, flat roofing, plastering, painting, decorating, snow boards, abseiling, flood damage and pest deterrents. HAS G&A ROOFING GOT A HEALTH AND SAFETY POLICY? Yes. Our health and safety policy has been carefully put together to comply fully with the current regulations. 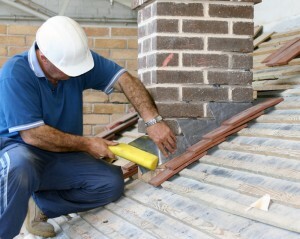 It covers every aspect of emergency roofing, general roof repairs and planned works. We are proud of our excellent safety record with no incidents in 25 years. Each and every job undertaken by us is risk assessed whether it is a re-roof or just an odd tile. DOES G&A ROOFING HAVE INSURANCE? We carry full public liability insurance and 10 million pound employers liability insurance.